This is a Danish Americana music put out on a garage rock label (Heptown Records). J-Tex was born in the USA but has lived most of his life in Denmark. For the most part the record has a sound country flavor to it with a bit Dylan thrown in at times (That is what you want!!). And he will remind you of Tom Waits for sure. It comes packaged in authentic garb, including deliberately scuffed and creased cover...it looks the part and that’s part of it’s eye catching appeal. As for the music, we are in Hillbilly/Country/American folk territory. How they have managed to make the album sound as though it was made back in the 40’s/50’s is beyond me, but it’s very well done and as different as anything I’ve heard. I am glad I am having it here. For sale. For you! This CD has a huge variety on it and is well played loud and over and over again. Check it out!! Turn it up! Loud is fun!! The authenticity dripping from this album will have you checking your CD player to see if it has a 78 rpm setting. More importantly, it has an undeniable spirit at its core that can't be faked. 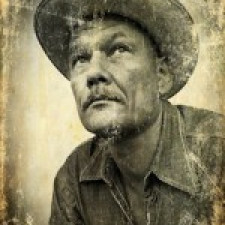 J. Tex is a Dane who recorded these 12 songs of dustbowl Great Depression country blues, mostly solo and in a Swedish studio. A case of music truly crossing all borders. Tex's mission was simple. He'd had a lot of fun touring his band, The Volunteers, with whom he'd recorded two albums for Heptown Records, but wanted to pare things back. He headed to Malmo, rot a placed called The House On The Hill, roped in the occasional collaborator and three days later he had an album. Tex calls his music "true country" and who are we to argue? In most respects, acoustic country blues provided the white man's entry point into what became rock and roll. Tex has tapped the motherlode and plays this stuff like he's lived it. Man's got character. Mostly originals with the three traditional ("Washbah Cannonball", "Black & Blues Blues", "Omie Wise") and Woody Guthrie song ("Ain't Got No Home") thrown in, this is the sort of record that's subtly engaging. It's something you play when your ears are fried or the sun's peeking over the horizon and volume is a consideration. The bright note among some mournful tunes is "What a Bummer" which manages to name-check some contemporary cultural reference points. At times "Misery" is so low-key that you think you slipped into a time warp and landed in a dusty Kansas speakeasy where most of the job-less patrons have passed out on moonshine and only an old guy with a guitar remains standing. Flashes of banjo, violin, harmonica and upright bass fill out the sparse sound. It's warmly recorded and sounds fabulous. My name is Sabina Chantouria, I´m a half Swedish and half Georgian singer/songwriter living in Lund, (Sweden). My wish is to make music that moves people in different ways, my music is what feelings sound like. :) I sing, play guitar and write my own music, I would describe it as melodic pop. Take care & hope to see you soon! Det är du som bestämmer vilka band som får äran att inta scenen på Gustav Adolfs torg mellan klockan 19.30 och 21.00 den 18 augusti. Här nedan har jag lagt upp två grymma konsertförslag för dig att välja mellan och fram till den 11 augusti kan du rösta på dessa och själv föreslå dina absoluta favoriter. De första två banden som får 800 röster, av sina fantastiska fans blir spikade och klara för spelning. Du lägger din röst genom att logga in här på Emues och enkelt klicka "Get FREE Ticket". Vilket band vill du se live på Malmöfestivalen i år? Vi ses framför scenen i festivalyran. Sabina Chantouria Together with J.Tex was confirmed. Sabina Chantouria Together with J.Tex was accepted.